UAH global temperature for October, down significantly | Watts Up With That? Down from 0.37 in September. Global composite temp. : +0.22 C (about 0.40 degrees Fahrenheit) above 30-year average for October. Northern Hemisphere: +0.23 C (about 0.41 degrees Fahrenheit) above 30-year average for October. Southern Hemisphere: +0.22 C (about 0.40 degrees Fahrenheit) above 30-year average for October. Tropics: +0.04 C (about 0.07 degrees Fahrenheit) above 30-year average for October. 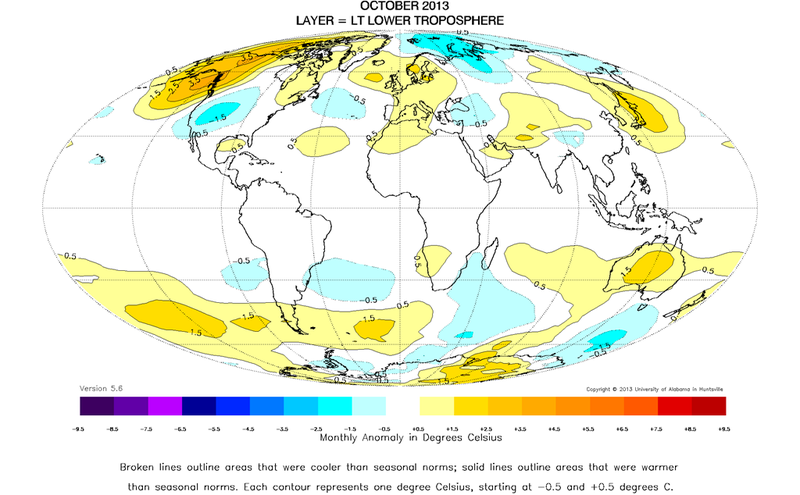 In October the atmosphere saw a general cooling relative to September, according to Dr. John Christy, a professor of atmospheric science and director of the Earth System Science Center at The University of Alabama in Huntsville. Temperatures over the tropics fell back to near normal, which is consistent with a neutral year where there is neither an El Niño Pacific Ocean warming event nor a La Niña cooling event. Compared to seasonal norms, in October the warmest area on the globe was in the Gulf of Alaska near Juneau, where the average temperature for the month was 3.93 C (more than 7 degrees F) warmer than seasonal norms. The coolest area was in the Kara Sea north of Russia, where tropospheric temperatures were 2.59 C (about 4.66 degrees F) cooler than seasonal norms. Sorry for the confusion, but half the data were missing in our October update…we have been waiting for the remaining data to arrive so we can process it. The press release must have been “released” by accident. The full October update will be posted on Monday the 11th. All of the heat has gone into the lower troposphere instead of the deep oceans. It is probably trying to find a safe place to hide before the new ice age arrives…. 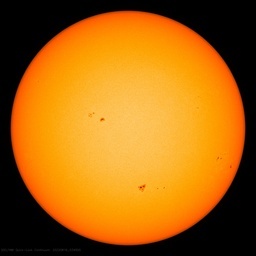 But of course, this has NOTHING whatsoever to do with the recent lower sun(spot) activity? All that’s happened is the ‘missing heat’ has gone into ever deeper hiding!! C’mon Trenberth, tell us where it is now?!! just as an addendum, does anyone know of any physical (i.e. demonstrated by physics) method by which heat energy can be removed from a system i.e. absorbed or hidden in a place where it cannot be detected? Somehow, I think not. Thanks to all, especially to Philip Gentry for the ending. Haven’t seen this for a long time. Sorry for the confusion, but half the data were missing in our October update…we have been waiting for the remaining data to arrive so we can process it [sic]. The press release must have been “released” by accident. Willis will get you now…. But how can this be? Here in Queensland we’ve just had our absolute hottest October ever ever ever ever since the Big Bang and beginning of the universe that preceded this one. I heard it on TV, so it must be true. Were missing, or are missing? In other words is this a proper release or not? RoHa, seriously? You Aussies only had ONE universe before the Big Bang? Hey, move up here on the top side of the planet, we got multiple universes starting hourly, mostly “alternates”, but they count don’t they? The press release must have been “released” by accident. I guess that means it did not travel faster than the speed of light from Dr. Spencer’s site, where it is not even up yet, to WUWT. Dr. Spencer, does “The press release must have been “released” by accident.” mean that http://nsstc.uah.edu/climate/2013/october/OCTOBER%202013%20map.png is “waiting for the remaining data to arrive”? Philip, shall I take it this report with the new map is official, but might be modified? I have published http://nsstc.uah.edu/climate/2013/october/OCTOBER%202013%20map.png in Observatorio ARVAL’s web pages. Thanks! I can’t resist, sorry Roy: Perhaps the missing data is in Phil Jones’ office. I guess we need a press unrelease. I am confused; Is http://nsstc.uah.edu/climate/2013/october/OCTOBER%202013%20map.png correctly showing the data for October 2013 or not? Nah, I wouldn’t worry about it none. See, ole Obama’s medical health care website can’t get it up, can’t get out on time regardless of a half-billion spent developing it, shares all of its entered data with anybody who wants to hack it – assuming any data can get entered at all by anybody at all that is – and this one that comes out early has missing data … that Obama doesn’t want anybody to read anyway under any circumstances. See, it all averages out. It’s pretty close to RSS and about what would be expected. Probably won’t change much when the other half of the data shows up. Can’t you get Peter Gleick to just make something up? There is always of course the discrepancy between the measurement of surface temperatures and satellite recorded temperatures and even tell BOM will tell you that drier summers are hotter at the surface leaving alone the siting of ground stations. This culprit for all the cold then of course was the strong 2010/11 La Nina. And the cause of the very warm 2013 is…. And regardless of what happens for the rest of the year, alarmists in Australia will be champing at the bit as records continue to be broken by their TV appearances. Parts of NZ also ‘supposedly’ had the hottest October since records began. 2C above average. We had just as many universes as you, if not more, but our temperature records only go back to the one before this. As part of an ongoing joint project between UAHuntsville, NOAA and NASA, Christy and Dr. Roy Spencer, an ESSC principal scientist, use data gathered by advanced microwave sounding units on NOAA and NASA satellites to get accurate temperature readings for almost all regions of the Earth. ironic that GISS NASA uses the less accurate surface thermometer readings. which co-incidentally show greater warming than the satellites. The opposite of what the climate models predicted would happen. All the climate models predicted that CO2 would cause the atmosphere to warm first, then the surface. Yet the observations are showing the surface is warming first, then the atmosphere – as one would expect if CO2 wasn’t the cause of the warming at all. does anyone know of any physical (i.e. demonstrated by physics) method by which heat energy can be removed from a system i.e. absorbed or hidden in a place where it cannot be detected? The scientific name is the “Trenberth Effect”. those are some very good thermometers…accurate to a hundredth of a degree. The one-half data hasn’t gone missing, it’s hiding deep in the oceans. Australian universes are upside down – bit like their cricket and rugby. This is the first proof-positive of super-intelligent aliens : obviously, a much more advanced civilisation, having previously suffered from, but survived, cAGW [the A is for Alienogenic, by the way], has decided to use its advanced heat capture and transfer technology to give the Earth a second chance! Shouldn’t the title of this piece be updated in light of Dr Spencer’s comment? I assume that it is not yet known what October’s UAH actually yet alone being ‘significantly’ anything. Perhaps the Update shouldn’t be tucked in at the bottom of the piece, some people may not read beyond the headline and the opening few sentences. I’d have to question two things about that statement. Firstly, if satellite data are more accurate than surface data then why is the divergence between the satellite producers UAH and RSS so much wider than that between the surface data sets over both the short and longer term? They both use data from the same or similar instruments, don’t they? For instance, this year to date (to September, given that the UAH October figure isn’t yet confirmed) the average RSS anomaly (base lined to 1981-2010) is 0.14; whereas with UAH it’s 0.23. That’s a difference of 0.09. Over the same period, and also base lined to the 1981-2010 period, all the surface data sets are in exact agreement on 0.19 deg C.
And over 15 years, the trend in RSS is +0.03 degrees C/dec; in UAH it’s +0.14 deg C/dec. A difference of 0.11 deg C per decade between the two satellite producers. In the surface sets, over 15 years they range from +0.07 and +0.09 deg C per decade. That’s a difference of just 0.02 deg C.
This brings me to the second question: over both the short and longer term UAH satellite data show more warming than that of any other global data set, whether satellite or surface. As mentioned above, UAH has been the warmest data set this year to date; +0.04 warmer than all the surface sets when based on the same anomaly period. Also, over 15 years the rate of warming in UAH has been clearly the fastest of all the global data sets, a full +0.04 deg C/decade warmer than its nearest rival, which is GISS. So I don’t see how you can fairly say that satellite data are either more accurate or show less warming than surface data? Am I supposed to re reassured by this? The Obama government is one of the biggest perpetrators of the Global Warming/Climate Change CON. The skeptics – who are funded by themselves – are the ones doing the real Climate science. So don’t go bragging that you aren’t funded by oil and gas interests. Being funded by a blatantly corrupt government is nothing to crow about. firstly, the plot shows that your assertion is wrong, the surface data-sets are increasing faster than the satellite data sets. secondly, the absolute difference between the surface temps is greater than the absolute difference between the satellite temps, indicating that the error in the surface temps is greater than the error in the satellite results. thirdly, the plot shows that the satellite data sets are converging towards the same answer, while the surface data-sets are not converging. this convergence indicates the satellites have been reducing the error in their signal over time, while the surface temperatures have not. and if we reduce the time scale of the series to match the satellite record, we see that the surface temps are actually starting to diverge, indicating that the error in the surface signal is actually increasing in more recent times as compared to the past. Likely because of the large reduction in surface stations that occurred 20 years ago has reduced the quality of the surface record. 1. CO2/GHG cannot be the cause of the observed warming. CO2/GHG warms the planet by warming the atmosphere. This warming of the atmosphere then warms the surface as a result of the lapse rate. As a result the surface cannot warm faster than the atmosphere due to CO2/GHG, which is contradicted by observation. When observations contradict theory, the theory is wrong. 2. The accuracy of the satellites is better than the surface records due to the smaller absolute error between the signals, and the accuracy of the satellites is increasing (convergence) while the accuracy of the surface records is decreasing (divergence). So over the past 15 years at least it’s clear that you can’t state that satellite data are more accurate than surface data, because they disagree more strongly with one another than do the surface sets. 2. The absolute difference between the total warming reported by the surface data sets over the past 15 years is 0.05 deg C (HadCRUT4 is +0.11; GISS is +0.15; NOAA is +0.10). For the satellite data it’s 0.16 deg C (UAH is +0.21; RSS is +0.05). So the absolute difference in total warming in the satellite data over the past 15 years is slightly over three times that of the surface data. You have not addressed either of the points I made initially. The disagreement between the satellite data is far greater than that between the surface data over both this year to data and for the last 15 years at least. And the satellite data show both the most (UAH) and least (RSS) warming over this year to date and over the past 15 years. The North American Rex Block had a substantial impact, look at the persistent cold pool that actually shows up on the month’s data. I do not think this is the final report. Certainly there is no October report on Roy Spencer’s own web site. Perhaps you have tried to be too succinct Dr Spencer. I will be waiting for the real data and will be commenting on it. The report never came out on Dr. Spencer’s web-site. I thought that was odd when I first read this. I hope the data holds up when the final report comes out. Just an “open mike anomaly”. Dr Roy, and Prof Christy, might have had a glass of wine with lunch ! I saw a claim that >700 spoof registration sites were up and running, though. That was per McAfee, IIRC, lamenting the lack of even rudimentary security. It was done by a quantum mechanic. Using a quantum hammer, assorted quantum wrenches, and a quantum screw driver. The heat just disappeared in one place and appeared at another. Spooky action at a distance. As mentioned, RSS was down for October. I would not expect much change. Makes 2013 the joint 6th warmest October in the UAH record and makes 2013 year-to-date (Jan-Oct) 4th warmest.